If you are looking for the exact opposite of a freerunner go no further than a mudder. What is a mudder? Well, the original definition can be found at the racetrack. Even in the worse of track conditions, racehorses still hold a linear beauty in their stride. But what if you throw a normal person into the muck? Will Dean, a former counter-terrorism agent for the British government, has thought about this and created a course that provides a little more gristle than the normal marathon or triathlon. In Dean’s opinion, these races are boring, but with ten miles of obstacles designed by the British Special Forces, his Tough Mudder certainly is not a yawn. I understand running a marathon can be a little monotonous, but is entering a Tough Mudder race the best option? 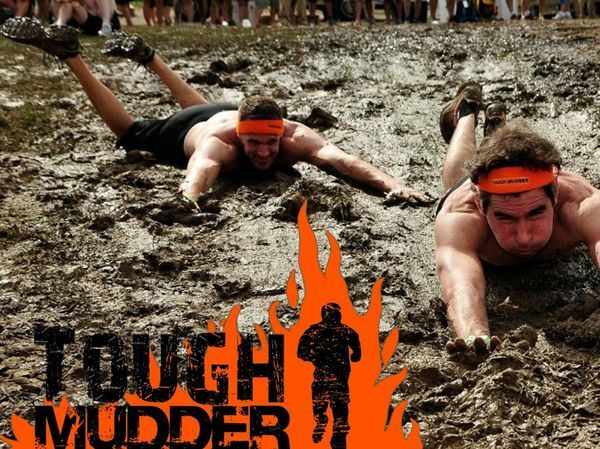 This summer down the road from me, Tough Mudder will sponsor its first event in Minnesota. And like most Minnesota events, it will be held in Wisconsin. What will await the mudders as they step up to the starting line in Somerset? They will start with a run; then jump over bales of hay, which seems very Midwestern. But after a quick frolic through the beautiful Wisconsin landscape, it’s into the mud to belly-crawl through a field of muck with razor-sharp wires overhead. Sounds fun? Well there’s more. Here are some highlights or lowlights depending on your point of view. Mudders must scale a 12-foot wall and jump into ice-cold ponds. Mudders must negotiate a narrow balance beam that precariously spans over another pond of–you guessed it–ice-cold water. Mudders then fall back into the mud after they lose their grip on grease-filled monkey bars. And then back into the frozen water to wiggle through half-submerged plastic tubes. Mud and frozen water, what part of this spells out Sunday afternoon fun? What enjoyment can be found carrying a log or hauling a tire up a muddy hill? Wait, there’s more. There are plenty of more walls to climb, mud to muck and cold water absorb. And just when a mudder thinks he or she is at the end, out come the shooting flames to fill the already convulsing lungs with acrid smoke. One question? Why do the organizers hand out beer at the end? I thought this course was designed by the Brits? Shouldn’t volunteers be on the course handing out cups of hot tea? Anyway, I complain too much from the comfort of my keyboard. What must be praised is spirit of the event. For being a down and dirty, the sentiment is quite admiral. The course is designed to break down the individual. There is a reason for that. It’s in part of the pledge the mudders recite before each event. Tough Mudder isn’t about sports. It’s about life. Mudders are strongly encouraged to enter as a team and to stick together through the thick and stupid mud. The mud can be seen as our day-to-day existence and sometimes we need a little help. It’s a beautiful analogy and a beautiful race even with the electric shock treatment. A traceur and freerunner believe life’s obstacles must be overcome with a certain amount of skill and élan. A tough mudder believes that life is a slog that must be overcome with sheer grit and help from mates. But is there a third way? If you think about it, does an obstacle need to be one?